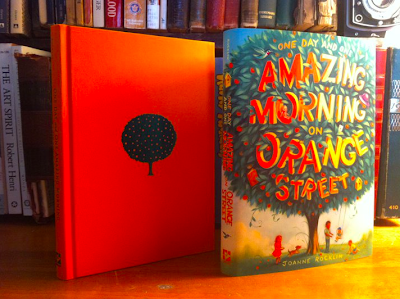 The kids of Orange Street always remembered that morning when everything connected in the glowing moments of the Magic Now, like juice and pips and pith inside the skin of an orange. When all that really mattered was an old tree, a baby bird in its nest, and a little boy's laugh. They would look for those moments all of their lives. And they would find them. Set on Orange Street somewhere in the city of Los Angeles, One Day and One Amazing Morning on Orange Street takes the ordinary, the difficult, the painful and the buried and looks at them through the prism of the "Magic Now." At the start of the story, the Magic Now is made up of all the different ways the children in the story, Bunny, Ali, Leandra and Robert, make sense of their world and comfort themselves when they are worried. Bunny, who has an interesting and humorous story behind her name, copes with the anxiety she feels whenever her mother travels for work via airplane by wearing her mother's gardening hat, chewing only on the right side of her mouth and climbing the orange tree in the vacant lot and waving to the plane as her mother flies by. This elaborate ritual is the perfect example of the magical thinking that kids sometimes use and is expressed in various ways by the children in the story. Ali, who's toddler brother Edgar is recovering from surgery to remove a tumor on his cerebellum, has some interesting theories about angels (they do live in Los Angeles, the City of Angels, after all) and, as a possible future archaeologist, she looks for meaning in the "artifacts" that she unearths in the empty lot on their street. Robert, a budding magician who has felt especially lonely since his parents divorced, his best friend moved to New Zealand and Ali and the other girls on the block stopped playing with him, writes Ali's name out of twigs, nasturtium seeds and other items from nature and leaves them semi-hidden on the empty lot in the hopes of resuscitating their friendship. Leanrda, the least prone to magical thinking but the quickest to express frustration, anger and bossiness, is worried about the health of her grandfather, who had a heart attack and now has a pacemaker, and the new baby that will join her family soon, which Leandra thinks "is one of the most embarrassing things to ever happen" to her family. Over the course of one day and one morning, the children's lives, their hopes and their worries, circle around the Valencia orange tree that has been growing in the vacant lot on Orange Street for some seventy years or more and through a series of amazing events, they find meaning, comfort and ease and a new sense of purpose in their world. I know that last paragraph makes One Day and One Amazing Morning on Orange Street sound like a pretty serious book, but Rocklin mixes in just the right amount of playfulness, humor and amazement to keep her story bright. She is a master at viewing and describing the world through the eyes of these children and, as children, they sense but don't always feel the true weight of sadness. While Ali is very aware of the change in her brother since his surgery, always hoping for a word or laugh from this once boisterous boy, she doesn't quite pick up on the true meaning of the memory loss of her neighbor, Ethel Finneymaker, also known as Ms Snoops. Ms Snoops and the other main adult character in the story, Larry Tilley, provide the opportunity to tell the history of Orange Street and the importance of that Valencia tree in the vacant lot. 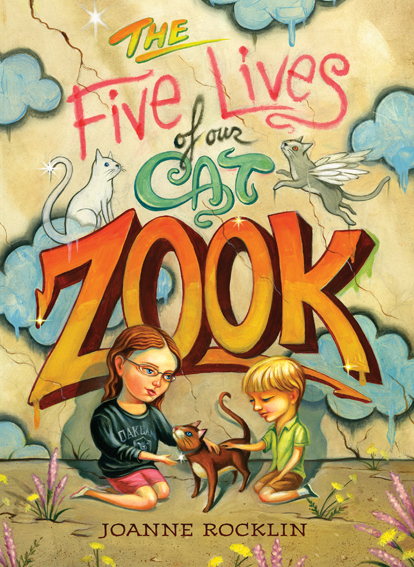 Their stories, while profound and sometimes sad, are told in a way that is understandable and appropriate for the young reader and packed with meaning for the adult reader, who can unpack the story for the young reader if s/he chooses to do so. The story is equally entertaining, either way. Ms Snoops' story goes all the way back to the Depression when she was a girl. The arrival Gertrude, distant relative of Ethel's neighbor, is the start of a sometimes rocky but mostly marvelous friendship that revolves around that Valencia. Gertrude's parents are fleeing Oklahoma and the Dust Bowl, looking for jobs. They leave Gertrude with uncaring but well off cousins, the best they could make of an awful situation. Decades later, Ms Snoops is the neighbor to the Tilley family, living on the lot with the old Valencia. Their story is one of sadness and loss, Mr Tilley enlisting for the Vietnam War from which he doesn't return and his wife never recovers. But this is understood on an adult level. What Rocklin brings to the story for young readers is the story of the Tilley boys, Larry and Pug, and their sometimes difficult relationship with their father. Both boys have inherited their mother's artistic talents and love to draw. But Larry, the older brother, hides his artwork when he observes his father's inability to understand the value of art. Later, while serving in the war, Mr Tilley finds enormous value in the drawings depicting their life at home that his boys send him and he has the chance to say so before he dies. The existence and the convergence of Ms Snoops and Larry Tilley in this story provide the catalyst for the amazing events that take place on Orange Street and exemplify the sense of community, belonging and importance that Rocklin imbues her magnificent novel with. As Connie Goldsmith writes for the New York Review of Books,"In one marvelous chapter the tree tells its own history…This deceptively simple book reminds us how important the things we sometimes take for granted are: friendship, family, love, and the interconnectedness of our everyday world.” I couldn't agree more. I hope that this book is widely read by librarians and considered for the Newbery Medal in 2012 - it is definitely worthy. Readers who like One Day and One Amazing Morning on Orange Street might also enjoy Strawberry Hill, the semi-autobiographical novel of her childhood by current Children's Poet Laureate, Mary Ann Hoberman. Also, for one last interesting tidbit, please be sure to visit the blog of Chad W Beckerman, art director for Amulet Books, Mishaps and Adventures. I love stories, but I also love the books themselves and two of my favorite publishers of excellent books with a very high production value are Amulet Books and Candlewick Press. It is such a treat to visit Mr Beckerman's blog and see the evolution of a book cover - the various ideas that are tossed around and the eventual outcome. One of my favorite posts is the recent Jacket and Case in which he writes, "In an age when books as objects are being thrown into question It is now more than ever that a designer should think of a book as a complete package. I believe very strongly that all the elements of a book from the interior to the case should appear that they belong together with each other," then gives wonderful example of books he has designed that exhibit this, including One Day and One Amazing Morning on Orange Street. All the more reason this book is worth spending your hard earned dollars on! The Five Lives of Our Cat Zook! Sorry to say, we gave up on this one at about the halfway point. We tend to have a pretty long attention span, but Orange Street just didn't grab any of us -- too many characters, none of whom seemed very compelling, no cohesion, and nothing much happening. Perhaps we quit just before the story took off, but before story time last night we took a vote and it was 3-0 in favour of trying something else. My daughter read this book in the last month of sixth grade. Right from the first chapter she really liked it. By the end she declared it was her new favorite book. She wants an autographed copy for her birthday! That is so wonderful to hear! Joanne Rocklin is a very lovely person and she is on Twitter. Send her a tweet and I bet you can get an autographed copy. If that doesn't work, email me and I'll see what I can do. I'm going to hear her speak at a conference in August.